The Porsche Club Great Britain was formed in the early sixties and is now the second largest Porsche Club in the world. With a current growing membership of seventeen thousand members divided into thirty one Regions. We are Region 24 which covers the area of Bedfordshire and Cambridgeshire. Our Regions remembers have a wide range of cars from the very early 1950’s cars, up through the years to the front engine water cooled cars, then onto the range of cars currently available at your Porsche Centre today. The club also runs thirty three Registers where members can obtain technical advice of their model of cars. The Club Headquarters is in the Cotswolds where events are held throughout the year. At Clubhouse you will find a display of cars and our Club shop. The Club also produce a monthly magazine. the Porsche Post..
On the club web site https://www.porscheclubgb.com/ you can join in forum chatter, seek technical advice and keep upto date on all things Porsche.. Members can also benefit from discounts offered by various suppliers and partners of the club. The club also has a Motorsport section and hold three race series in various locations. The Club Championship,The Speed Championship, and a Hill Climb Championship. Also run by the Motorsport section we hold track days where members can put both their cars and their self to the test at well known race circuits.. Region 24 hold monthly meetings at The Old Ferryboat Inn, Hoylwell . The Ferryboat is set in a lovely location in the heart of Region where you can dine by the river. We have our own private Club Room and ample dedicated parking to display your pride and joy. At monthly meetings we have various guest speakers (not all Porsche related) and a variety of competitions. We also have ‘News at Ten’ (NAT). NAT will bring you up to date with events both National and Regional. The Region’s committee organises various events during the year and aims “to provide a variety of quality events that we think will appeal to all our members and families throughout the year”. We attend local shows, visit Porsche Independent specialist, we also hold Drive and Dine events, Christmas lunch, why not join us on a WOTY (Weekend of the Year) and join the convoy driving to great venues and events both at home and abroad? We also work closely with the Porsche Centre Cambridge and regularly attend events at the centre. 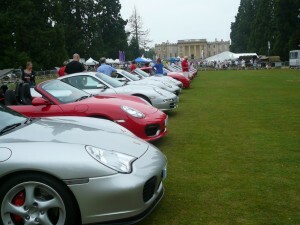 The Porsche Centre also sponsor the Region’s Annual Concours event. 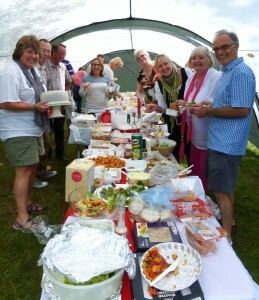 The Region have been attending and supporting the SBMC at Kimbolton for many years. The event has become a firm favourite on the events calendar. If you own a Porsche and are not a club member, or perhaps you are thinking of buying a Porsche, or even if you just want to chat Porsche you will be most welcome to come over and see us on the Club Stand. We look forward to seeing you all whatever you drive. Enjoy your cars, clubs and Kimbolton Event.